Occupational therapy helps children reach their full potential. Our occupational therapists work with the children and their families to help regain or develop independent function and skills. Occupational therapy can help children with physical, mental or cognitive disorders develop, maintain or recover daily living skills. Therapy focuses on improving fine-motor and oral-motor skills, perceptual and sensory processing, and neuromusculoskeletal function. Therapists also help children with self-care, feeding and managing assistive devices. Your child’s occupational therapist will examine how he performs a variety of functions and tasks. This includes upper extremity use, how your child calms himself down, planning and making movements, handwriting, cutting with scissors, and processing information through the senses. Therapists apply positive, team-oriented treatments to help children function at the highest possible levels at home, at school and during play. Children’s occupational therapy services are available at all nine of our outpatient locations. In addition to outpatient treatments, our therapists also provide inpatient rehabilitation. Aquatic therapy offers an alternative environment for occupational and physical therapy that provides gentle resistance and buoyancy, making movement more comfortable. The warm-water environment relaxes muscles and reduces pain. The Aquatic Therapy Program at Children’s is designed to make therapy fun. Our therapists incorporate water games and activities in individual and group settings. Aquatic therapy can help your child improve mobility, coordination, strength, endurance, balance and self-confidence. Move independently more easily, with less pain. Assume an upright posture earlier. Slow down movement to accommodate balance difficulties. Perform activities safely at a greater resistance than on land. Be less hypersensitive to touch. Children’s aquatic therapy services are available at Scottish Rite hospital and at the Robert D. Fowler YMCA in Gwinnett County. Our pediatric-trained therapists and doctors provide wide-ranging treatment and continuous care to make it easier for our patients to use their shoulders, arms, forearms, wrists and hands. Our pediatric occupational therapists provide CIMT for children with limited use of one arm and hand. The goal of therapy is to improve function and strength in the weaker side by restraining the stronger side. The therapist places a temporary cast or sling to restrain the better arm and hand, which means your child must use his weaker arm and hand. This retrains the brain and helps your child learn new ways to move and function. Talk to your current therapist to determine if CIMT is appropriate for your child. Call Sheelah Cochran at 404-785-3781 for more information. Pediatric occupational and physical therapists provide task-oriented strengthening for children with a condition or injury that affects their ability to perform daily tasks. Therapy consists of exercises that help train the brain and teach the child how to perform his task. Therapy is different for every child and depends on his physical ability and needs. To ensure we meet the needs of you and your child, we conduct a caregiver consultation and therapist assessment to identify goals and design a therapy program. For more information, call Durga Shah at 404-785-3758. 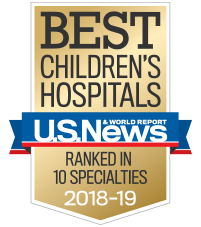 Pediatric audiologists and therapists at Children’s also provide vestibular rehabilitation services, including comprehensive evaluation and treatment, to identify and relieve symptoms of ear-related balance problems.